In my first blog in this series, I highlighted some of the main challenges teams face with trying to scale mainframe DevOps. To get past these hurdles, the key is to develop an incremental approach that enables teams to capture value along each step of the journey. With this approach, software bottlenecks are identified and addressed based on the business need – enabling Dev, QA, and Ops teams to work together to deliver better business outcomes. Here are the three major steps for taking an incremental approach to DevOps. The first thing you need to do is "See the System." It's important to get a common view of the work to ensure transparency across the organization. At a system level, you'll need to create a common view of your mainframe deployment pipelines and their interdependencies with distributed environments. This includes highlighting the bottlenecks, waste, and other inefficiencies that can be optimized by using DevOps practices. Ultimately, this common view will serve as the forcing function to help align teams across the organization. Gaining application visibility, control, and insight will also provide teams with a better understanding of the impact of a software change at the application level. This transparency will allow for better estimates of the work in progress, which can be leveraged to reduce rework and provide early detection of production issues. By embracing this sort of agile development practice and leveraging modern development IDEs, developers will be able to discover issues earlier in the process – boosting productivity and delivering secure features faster to improve collaboration and alignment across both mainframe and distributed teams. In order to support faster and more frequent releases, the next step is to ensure the DevOps toolchain is integrated across the entire value stream – from planning phase straight through to managing the application in production. This will allow for a seamless "best of breed" integration across mainframe tools into the broader DevOps toolchain eco-system. If your current set of tools don't provide adequate integration, it's time to consider upgrading to more modern mainframe solutions. Think about it this way: the more complex your software delivery process is, the greater the need for a flexible, adaptive, and integrated DevOps toolchain. Furthermore, the integration architecture needs to be open and extensible, so that it's capable of integrating with open source tools while maintaining access to and integrity with core systems and data. This will help reduce your reliance on costly mainframe infrastructure. A good place to start is with automation. Automating mainframe environment provisioning, testing, and deployments will dramatically reduce manual effort, increase deployment frequency, decrease lead times and produce fewer production incidents. Having the option to automate and re-host mainframe test environments can dramatically accelerate time-to-market at a much lower cost. This is because testing can consume an enormous amount of mainframe processing power, which keeps mainframe costs high. Lead times for mainframe test environments are often days to weeks. Re-hosting pre-production testing from the mainframe onto lower cost platforms can reduce lead times from days to minutes. In addition, re-hosting test environments allows testing to scale up as required with significantly lower operating costs. In this incredibly competitive digital economy, the mainframe can serve as a critical competitive differentiator, but only if it participates in the digital transformation of the enterprise. The business requires "on-demand" software delivery, which means mainframe teams have to embrace the DevOps culture of change and continuous improvement. 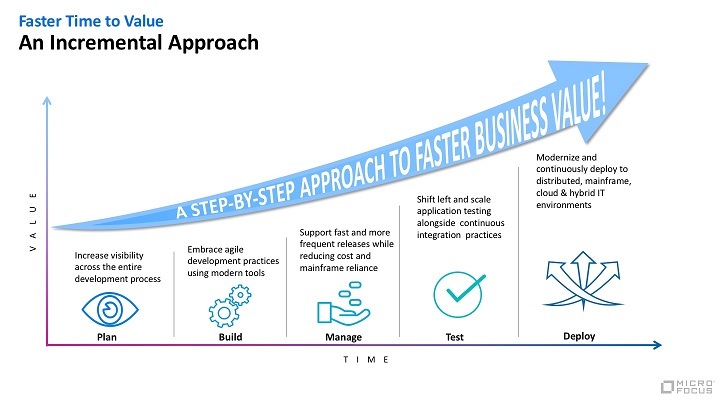 By breaking out of silos and taking the initiative to implement an incremental strategy to Mainframe DevOps, teams will be able to spend less time focused on delivering applications and more time on doing innovative work that adds real value to the organization.